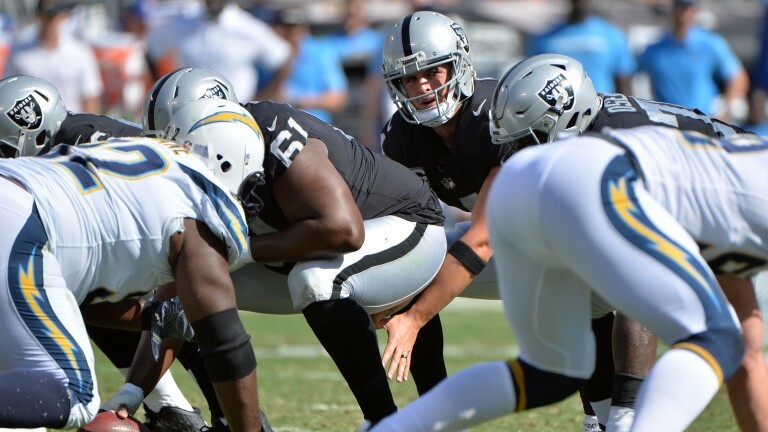 Kansas City and Oakland were expected to be battling it out in the AFC West this season, but while the Chiefs will be content with their first six matches, the Raiders look to have regressed. Oakland looked destined for a deep charge in last year's playoffs after a 12-4 regular season, but quarterback Derek Carr's broken leg put paid to their Super Bowl hopes. Optimism returned at the start of the campaign and everything looked fine after wins over Tennessee and the New York Jets, but four straight defeats have led to a lot of soul-searching. Their offence have come under the closest scrutiny and new co-ordinator Todd Downing has had to bear the brunt of the criticism as running back Marshawn Lynch has rarely sparkled and receivers Amari Copper and Michael Crabtree are not providing much of a deep threat. An all-division clash could spark them into life, but the Raiders face a tough task against the Chiefs, who fell to their first defeat of the season when they lost 19-13 to Pittsburgh on Sunday. Kansas City beat New England in the opening week and have also been the only team to see off Philadelphia in the first six weeks of the campaign, so it seems natural to anticipate a positive reaction from their Steelers setback. Quarterback Alex Smith has been excellent this season - apart from a dropped snap that led to a safety on Sunday - while running back Kareem Hunt looks a hot favourite to win individual rookie honours. However, they have been a tough nut to crack defensively. While their wins over the Patriots and Houston were shootouts, they have conceded 20 or fewer points in four of their last six outings. Andy Reid's team have also developed a good habit of bouncing back - they have covered the handicap on the last five occasions they have lost their previous match. The total points have gone over the total in seven of Oakland's last eight home matches, but this could be an occasion that does not follow the pattern. Running back Charcandrick West is doubtful with concussion while offensive lineman Larent Duvemay-Tardif has been nursing a knee injury. Offensive tackle Marshall Newhouse has a foot injury while cornerback Gareon Conley has been nursing a shin problem.